Here you can find answers to questions like: My cat is 1 years old. How old is he/she in cat years? What is the cat years equivalent for a 1 year cat? 1 year is equivalent to how many cat years? You can use the this Cat Age Calculator also known as Cat Years Calculator to find your cat's age in cat years (cat's relative age), as if he/she were a human, or your age in cat years. This calculator is based on the average lifespan of a healthy cat. Experts say that a one year old cat has roughly the age of a 15 years old human and a two years old cat has the age of a 25 years old human. After two years old the cats mature slowly, so that a 15 year old cat is roughly comparable to a 76 year old human (see the graph below). Cats that live indoors can live longer than cats that live outside. Note: There is no reliable method for calculating precisily how old your cat is in human years equivalent. So, it is possible to find calculators that show diferent values for the same human age. It is because there are different models to calculate the cats age. 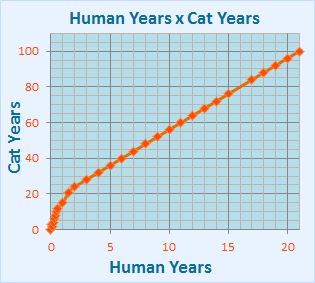 Approximate graph of cat age versus human age. What are the facts on cats’ longevity? The ideal cat “can” or “may” live to 20 years and older. On average, wild, homeless, and feral cats live dramatically shorter lives than domestic cats. Outdoor cat lifespan ranges widely, anywhere from three to 10 years. Indoor cats live nearly three times as long as outdoor cats. The numbers varied widely ranging from 14 to 20 years. source: http://www.catster.com/lifestyle/how-long-do-cats-live-cat-health-facts.